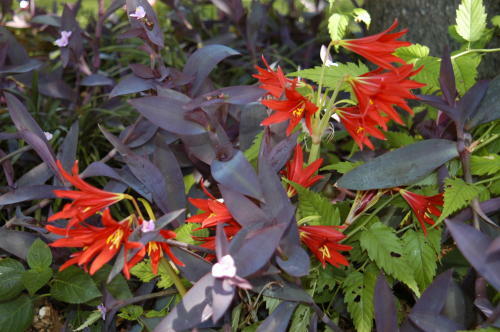 HABIT: Fall blooming perennial from Argentina that grows well in all soils including clay. After heavy rains in the fall, the deep red flowers sprout on stems about a foot tall. Grows to 10 inches tall, 12 inches bright red funnel shaped flowers, straplike leaves emerge after blooms then vanish in summer heat of the next season. Red fall flowers on bare stems. Blooms about the same time as the red spider lily, Lycoris. Flowers look like small amaryllis. CULTURE: Late summer blooms do best in morning sun and afternoon shade. Grows well in sandy or heavy clay soils. Plant 3 inches deep, dig and divide after flowering if needed, takes 2-3 years for a planting to become established. Increases readily as bublets form around mother bulb. Best to dig, divide and transplant in summer as the foliage turns yellow and dies. Flowering is triggered by late summer, early fall rain. Good to use under deciduous trees. USES: Fall color in large drifts or borders. Fall color highlights or drifts. PROBLEMS: Finding any to buy.